We manufacture the current sensing transformer coil highlighted here, in large quantities. Designed for use in a smart power meter, it requires very tight mechanical and electrical tolerances in order to provide utilities, commercial customers, and homeowners with accurate information on energy consumption to help them manage energy usage. Production involves several different custom components, specialized tooling and dedicated production equipment to ensure a very high yield rate of conforming product. The product development cycle leveraged the talents of our design engineers, manufacturing engineers and procurement manager. Working as a team, they developed a highly evolved system for manufacturing this product with long run reliability. To ensure high mechanical accuracy for a proper fit, we created custom plastic bobbins, covers and packaging for this smart meter coil, which featured dimensions of 91 mm in length x 50 mm in width x 25 mm in height. We also had to locate a reliable source for a specialized rectangular magnet wire specifically sized and insulated for this application. Inside our manufacturing facility, we promote the use of cellular production to support the smooth and predictable flow of materials and components through the manufacturing cycle. It also gives us the flexibility to adjust production rates based on the variability of volume demand. Because this project involved the use of flat wire, we engineered a work cell that incorporated custom winding equipment, stripping equipment specifically designed for flat wire, as well as specialized electrical resistance brazing machines. A lot of research went into selecting equipment that allows us to achieve consistently high accuracies at very fast paced production speeds. As an ISO 9001:2008 certified manufacturer, we have numerous protocols in place for ensuring product quality. In process inspections, statistical process controls and robust mechanical testing were all integrated into our quality assurance plan for this product. Current production is at the rate of 250,000 units annually. To date, we have manufactured more than 1.8 million devices without any significant functional failures. Additional details about this project are presented in the table below. 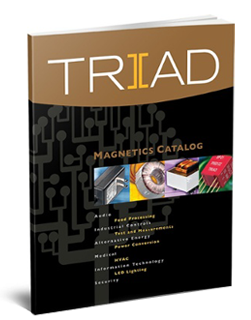 If you are interested in learning more about Triad Magnets and our custom design and manufacturing capabilities, we would be delighted to speak with you. This coil has very tight mechanical and electrical tolerances to ensure the high accuracy required. Custom components and specialized tooling and production equipment are required to ensure high production yields that meet all of the customer's requirements.